Founded in 1938, Surprise was just a sleepy square-mile farming community when it incorporated in 1960. Today, it's one of the nation's fastest growing cities with a new home completed almost every hour, and the state's largest Wal-Mart Supercenter. But Surprise is about more than just bricks and stucco. Poised on the northwestern edge of the thriving Valley of the Sun against the backdrop of pristine desert and stately Saguaros, Surprise is building a City beyond expectations - a well-rounded community where residents love to live, work and play. 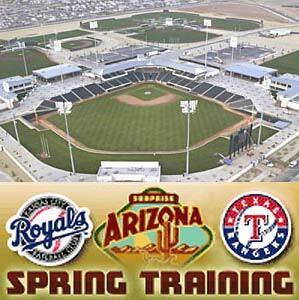 Surprise's award-winning stadium is the Spring Training home of the Kansas City Royals and Texas Rangers, and host to a charter Golden Baseball League team, the Surprise Fightin' Falcons. The well-respected West Valley Art Museum delivers a wide variety of art to Surprise's doorstep, while a satellite location of the world-renowned Heard Museum celebrates the culture of Arizona's Native people. The Surprise Recreation Campus, home of big-league baseball, a dynamic recreation program and special events roster, is at the center of the activity. Buoyed by a regional library, aquatic center, recreation center, community park featuring a five-acre fishing lake, giant playground and doggie park, and a 25-court championship tennis complex with center court seating for 5,000. Renowned retirement communities and award-winning master-planned family neighborhoods with new schools are filled with parks, walking paths and plenty of front-porch attitudes. Yet, Surprise property tax rate ranks among the lowest in the state currently at .8417 per $100 of assessed valuation. From a par-three chip and putt to championship courses designed by golf legends, test your skills on one or all eight of Surprise's public/private courses. Enjoy brilliant blue skies, magnificent sunsets and year-round hiking and biking in the White Tank Regional Park on the western edge of Surprise.